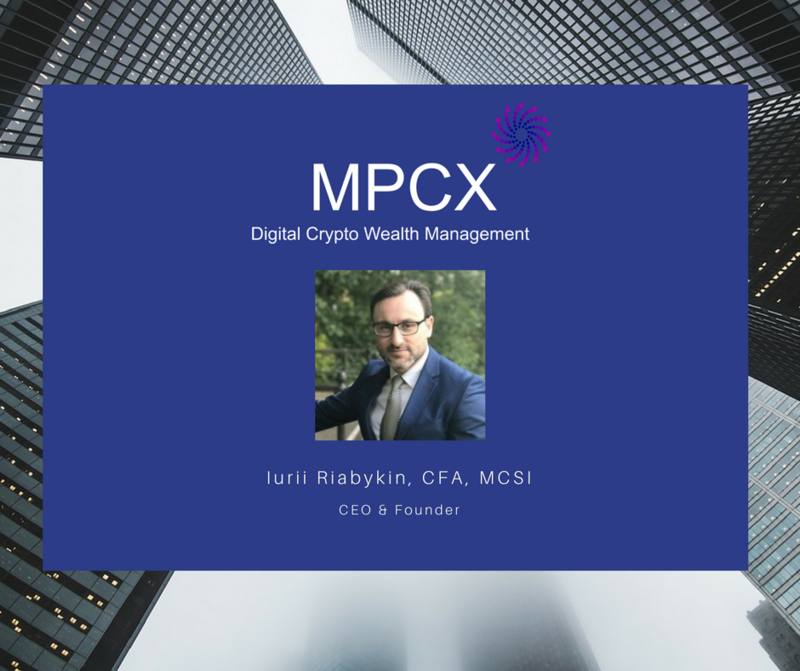 Today, we sit down with Iurii to discuss some key aspects about MPCX Platform and learn a little about his background. Iurii is the CEO and Founder of MagparCrypto Limited and MPCX Platform is a decentralized blockchain driven ecosystem managed by MagparCrypto. Iurii: At MPCX we apply a holistic approach. We will aggregate all crypto services into one place, will create in house blockchain solutions for digital wealth management, cryptocurrency exchange and trading, digital banking and then expand our expertise to traditional asset classless. We have decided to begin with Digital Crypto Wealth Management Platform to manage portfolios of crypto assets of innovative investors. Iurii Riabykin, CFA, MCSI is a highly qualified and experienced investment specialist and the member of several best respectable and recognizable investment societies around the Globe. He has built an incredible career in financial markets as Equity market professional and Wealth and Portfolio Manager. Iurii started his career as an Equity Sales, continued as a Fund Manager and eventually has become an innovative investor with strong belief and passion about the future of Crypto Assets and disruptive abilities of blockchain technology. Q1. Iurii why you have decided to create MPCX? A1. I believe in the disruptive potential of blockchain technology. In the next three to five years Global financial industry will be disintermediated and the way of doing business will be changed significantly. A lot of traditional banks, brokers and wealth managers will become ineffective and eventually leave the market. We are in the beginning of a new economic reality. As an Innovative investor, I make a bet on technological future for this reason we decided to create MPCX and to become one of the first blockchain driven financial platforms. Q2. Why MPCX is unique? A2. We put Proof of Governance (POG) concept in the center of MPCX’s development. It means that each XDMC Token holder can participate in a referendum and decide how to develop the platform. XDMC Token holders will be rewarded for the platform’s development impact. Q3. What are MPCX’s development plans? During the first stage MPCX will create a blockchain driven decentralized ecosystem to manage innovative investors’ portfolios of crypto assets. Q4. Iurii what are the biggest challenges of MPCX’s development? To deliver all development plans timely that’s is why we decided to build MPCX in three stages. Winning support and earlier adoption from our community. We are running several social media channels: Facebook, Twitter, Medium, Instagram, YouTube, Telegram and LinkedIn. These social media very important for us and allow transparently communicate with our community. We appreciate if you join us on social media and back our project. Gaining adoption with our first clients (innovative investors) where our team’s wealth and portfolio management experience will be most helpful. Q5. What should reader do to learn more about MPCX and XDMC Token? A5. I would like to suggest going to our website http://mpcx.co, read the MPCX’s Whitepaper or simply join us on our social media channels: Facebook, Twitter, Medium, Instagram, YouTube, Telegram and LinkedIn.